Earlier this year, I decided to buy a juicer ; it is my most exciting purchase yet. I was first introduced to juicing through the crazy fabulous world of veganism, raw food, and detox. 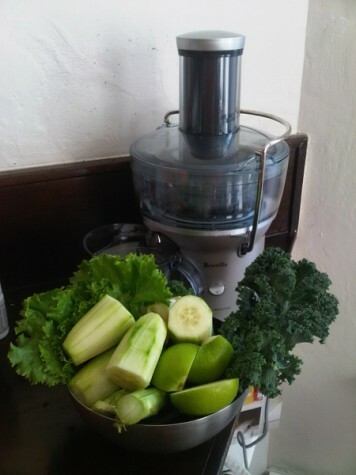 Once I learned all the yummy details, I just had to get my hands on a machine that can spout out glorious green juice. When you think of juice, you might think about juice fasts. And then you might think, well, how can you do a juice fast? No food? That’s not enough! Actually, juice fasting will not deprive you of any nutrition. You are basically getting all the nutrition you need without the fiber and thereby letting your digestive system take a little break. In fact, you’re getting a lot more of those kale, spinach, broccoli, carrots, and green apples in to your system more than you would ever imagine in your wildest dreams. Although some people fast for three weeks, one week, or even a few days, I opted to just add green juice as my morning routine. It takes me 30 minutes to prep the fruits and vegetables, juice, drink, and clean my juicer. A perfect way to start out my day in a healthy way! Rinse all the fruits and vegetables. Cut the fruits and vegetables into smaller pieces that will fit into your juicer. (If you have a wide-mouth juicer like mine, then no need to cut anything except for the apple, which has to be quartered). Turn on your juicer, and then juice away! If you don’t have a juicer, you can also make green juices by using a blender and a nut milk bag (available in any grocery store). Blend all your fruits and vegetables in a blender with 1-1/2 cup of cold water. Strain out the pulp using the nut milk bag and voila! 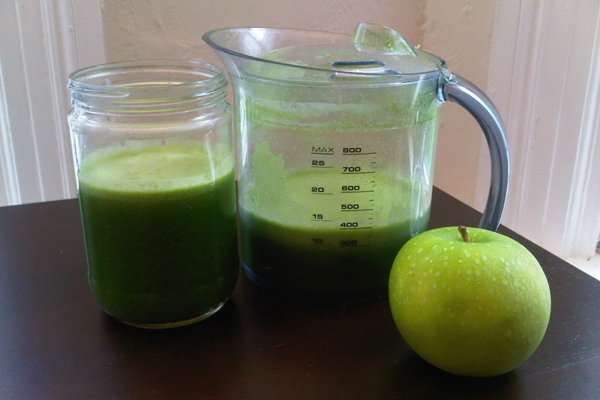 Green juice! Wow, do you notice a change in your health? You have inspired me to buy a juicer and incorporate a green juice into my morning routine!! What a great and simple way to add nutrients to your diet. so just the green juice for breakfast or is it in place of our regular breakfast orange juice? This post is truly a fastidious one it assists new internet people, who are wishing for blogging. Do you have the nutrition information? Thanks. Love my green juice too! It’s completely changed my life, my skin, my energy levels and my overall mood!